Interesting facts about energy sources, energy news and energy articles. Geothermal energy is energy generated by heat stored beneath the Earth's surface. Geothermal energy is often referred to as geothermal power. Geothermal energy supplies less than 10 % of the world's energy. Geothermal energy is clean and safe for the surrounding environment. 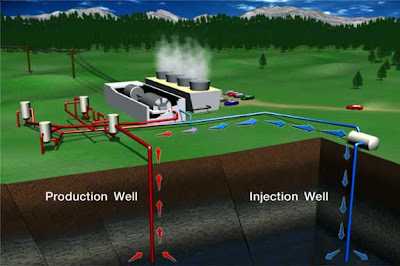 Geothermal energy is sustainable because hot water can be re-injected into the ground. Geothermal energy is extremely price competitive in suitable areas. Geothermal energy suitable areas aren't widely spread. Geothermal energy is main energy source in Iceland. Geothermal energy is very important energy source in volcanically active places such as new Zealand and Iceland. Geothermal energy source (click on picture to enlarge). 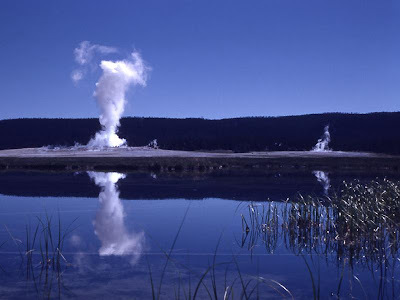 Geothermal energy can be found in the form of volcanoes, hot springs and geysers. Geothermal energy has three main uses: Heating, Electricity generation and Geothermal heat pumps. Geothermal energy is used since ancient times in form of hot water. Geothermal energy exploit uses three basic types of geothermal power plants: Dry steam, Flash steam and Binary power plant. Geothermal energy use has very low emissions of greenhouse gases to about three percent of the carbon dioxide emissions of a fossil power station. Geothermal energy is widely used in California with more than 30 geothermal power plants that are producing more than 90 % of the geothermal electricity in the USA. Geothermal energy's amount of electricity is less than 1 percent of total electricity produced in the USA. Geothermal energy is also widely used in the state of Nevada. Geothermal energy got its name from Greek words: geo (earth) and therme (heat), and therefore geothermal energy is in fact Earth's heat..
Geothermal energy has minimum negative environmental impact. Geothermal energy is giving 18 % of Iceland's total electricity. Geothermal principle (click on picture to enlarge). Geothermal energy could produce 10 percent of US electricity by the year 2050. Geothermal energy could supply US with more than 30,000 MW of power by 2025. Geothermal energy doesn't depend on the sun like other renewable energy resources. Geothermal energy widely exploited in Iceland, New Zealand, Japan, Italy, Philippines and in USA mostly in California and Nevada. Geothermal energy is taken from Earth with the help of geothermal heat pumps. 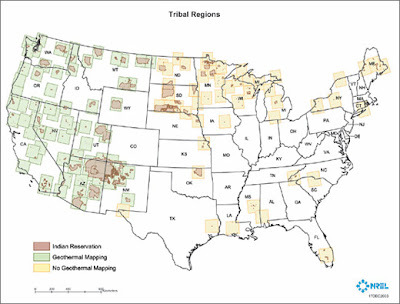 Geothermal energy can be easily found and exploited along the "Ring of Fire" region. Geothermal energy is extremely efficient (almost 100 %) energy source where only real source of losing energy is from turbine friction. Geothermal energy has only one real problem and that is lack of easily accessible sites. Geothermal energy's advantage is also the fact that geothermal power plants run continuously day and night with an uptime typically exceeding 95%. Geothermal energy's advantage is also the fact that geothermal power stations are relatively small, and have a lesser impact on the environment than for instance hydroelectric plants. You said that geothermal energy does not need the sun, but the sun controls the water cycle so when it rains it creates groundd water and if the sun disaperes not matter how hot the earths mantle or core is the earth would freeze. so geothermal energy along with everything else on this planet needs the sun. this is a very helpful website thank you very much! Having visited many sites in the United States that could be viable sources of geothermal energy, I continue to question the drive to keep doing the same thing, i.e. fossil fuels, wind, solar, nuclear, bio fuels.. does anyone realize the potential of the earths' core as an unlimited source of energy. Technonogy today can and should look in that direction. Some already have. To Michelle,Geothermal energy uses underground aquafers. Many of which do not have active inputs from surface deposition, and are considered a closed system. There are some which may be dependant upon surface water to replenish, but many do not, particulary the ones in desert regions which surface water replenishment is negligable at best. The energy being input is from Earths core, and the breakdown of radioactive particles producing heat, none of which is dependant on the sun. @michelle the earth mantle and core are heated by themagnetic field created by the earths rotation and therefore the sun does not directly effect geothermal energy. @michelle Yes naturally it would need the sun to replenish, but like stated by the person before me, the heat of the earth is not caused by the sun, and it's possible and has been done before where we "un-naturally" put water back into the ground. what are any possible threates of harnessing geothermal energy especially when it may deal with plate boundaries and volcanoes? I realize why everyone feels that geothermal energy is so great, but there are some negatives that come with the good. The two experimental power plants that have been made have both had to be shut down. In order to do this at a industrial scale, the wells dug must be fairly deep. Due to this, those plants experienced earthquakes due to their digging. Im not saying its not a great idea because it is a great one. However there will be alot more testing before geothermal processes can be safe at an idustrial scale. Could I just point out that one of the facts was that geothermal's only prolem was that it had a lack of easily acessable sites, the steam, when withdrawn from the ground, releases gases which contribute to global warming and acid rain. They are also noxious if released into the air. What about using areas around Yellowstone park? It has the worlds largest culdara. Also instead of pumping water into a well, why not place a looped steel pipe in the ground to a point were the underground tempature is hot enough to boil water that is then forced down the pipe. Thus creating a closed system u could use this near any vacano or hot spot like Yellowstone park. I agree with every one that says that geothermal energy is great... but the gasses that are realesed are harmful to plants animal and us! also there are limited spaces scientisets are working on man making an area for a geothermal energy. if they do then they are going to make a 4 mile building just for engeneers, omputers and workers for a 20 mile long geothermal energy plant. the down side is that they probab;y wont get to this until 2065. there is a huge upside that trumps all of this though that is that it could power over 15% of all power in Asia and Europe (Eurasia). Nice digestable list of facts and figures. Though I was depressed to find a Zeitgeist enthusiast follow up such a easy-to-digest list of facts with an extreme suggestion that this is the only energy source the world needs... When the facts state that's not possible. If you're going to sing something's praises, how about learning about it properly first? When those calling for positive change make ludicrous suggestions that counter the facts provided, then change won't happen. In fact, what you actually do is lower the credibility of sustainability-based causes everywhere. So please stop - It's hard enough to convince people as it is. I disagree with you when you say that geothermal energy sites are hard to get to. I believe that anywhere on the Earth has potential to be a geothermal power plant site. Hey guys I am doing this topic for my 8th grade Science Fair can anybody help me understand this even more so far I understand steam rises up because of it's lighter density and pushes a turbine and this has the potential to create lots of energy. This was a very helpful source. -It comes from magma and the radioactive decay of uranium, thorium, and potassium. How do we extract it? for more info please email me! This can't end the use of fossil fuels because there aren't enough geothermal cites around the world, and geothermal energy can't be transported. im confused with why we dont use geothurmal, wind, or solar energy if there so acsessable and they dont polute the enviriment? there better than fossile fules right? sooo...? sure they have bad things that come with them.. but every thing does, its either or, right? If geothermal energy is so great, why doesn't everybody use it then? I mean it's renewable and reliable. I hadn't heard of it before I was assigned geothermal energy for my science project. I think that more people should use geothermal energy. One question: Does anything happen to the earth if everybody uses geothermal energy? geothermal is very efficient and it eventually pays itself off by reducing the cost of heating and cooling and in time paying for itself. (by the savings) But, the installation and geo units are expensive. theyre are now alot of incentives in many areas. the gov't and certain geothermal companies offer incentives/ and pay you for a percentage of the installation and your current source of heating and cooling. Why go for geothermal energy? Shale gas - Transitional energy option? Hydrogen – Fuel of the future? For any questions, comments, remarks or anything else contact me at davor.habjanec@gmail.com.